Stronghold is a game telling the story of a siege. Players take opposite sides, one has to defend the stronghold, the other has to breach the walls as soon as possible. As time passes, defenders get Victory Points every turn for their efforts on the walls. 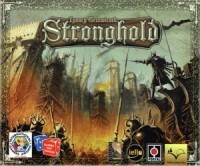 Add a Review for "Stronghold"